Bellator 192: Rampage vs. Sonnen at The Forum in Inglewood, California aired for free Saturday night on the Paramount Network after the promotion rebranded from Spike TV. The card saw and exciting night of fights highlighted by the opening round of the 2018 Heavyweight Grand Prix and a welterweight championship show down. Chael Sonnen (right) lands a kick on Quentin “Rampage” Jackson (left). “The American Gangster” Chael Sonnen was victorious in the first leg of the Bellator Heavyweight Grand Prix against Pride legend and former UFC Light Heavyweight Champion Quentin “Rampage” Jackson. Both contestants competed heavier than they ever did in their prime and it showed. Sonnen looked like a soft 222 lbs in comparison to his previous bout in which he was victorious against Wanderlei Silva. Though Rampage appeared to be in better shape than his last couple fights, the Tennessee native just looks too old, too fat, and too slow tipping the scales at 253 lbs opposed to the lean 205 lbs he used to dominate at. The Bellator Grand Prix has had a mixed reaction from fans, but the sharp with from Sonnen in the promos and in his post-fight speech reminded fight fans why this is fun for the sport. Next up in the Grand Prix lineup is “Big Country” Roy Nelson and Matt Mitrione in what will surely be an early finish with both fighters looking to score an early KO victory. 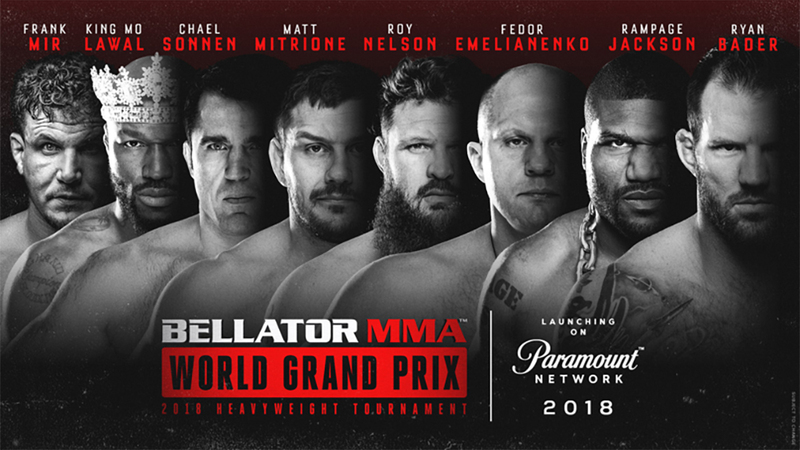 Fight fans can also expect Grand Prix action from legendary heavyweights including Fedor Emelianeko, Frank Mir, King Mo and current Bellator Light Heavyweight Champion Ryan Bader. Rory MacDonald raises his hands in the air after claiming the Bellator Welterweight Championship. “The Red King”, Rory MacDonald, claimed gold in the welterweight division in what was an absolute war. Now former champ Douglas Lima was viscous with his attack to the lower left leg of MacDonald throughout the fight. By the third round, MacDonald’s shin was so swollen that it had nearly doubled in size. MacDonald’s left shin after suffering leg kicks from Lima. Both fighters exchanged a barrage of strikes in the clinch as well as on the ground from a variety of transitioned positions. Razor-elbows and sharp punches had both fighters leaking, but the unrelenting will of Rory MacDonald to continue to fight through the pain push the pace of the fight was impressive. It is yet to be confirmed how serious MacDonald’s injury is beyond him not being able to put weight on it after the fight and having to be carried back to the locker room. The Red King showed the heart of a warrior and the spirit of a champion making his quest for Bellator gold complete after parting ways with the UFC. Aaron Pico looked sensational in his Bellator 192 performance against Shane Krutchen. Pico lead the charge from the opening bell against winning by way of body shot knockout. Pico, a featherweight product of the American Kickboxing Academy sent the message that the young prodigy is not just hype making this his second consecutive win by KO. Former 2x Bellator Lightweight Champion Michael Chandler smothered Goiti Yamauchi with a victory by unanimous decision. Chandler was very active in the contest controlling the position and pushing the pace despite taking multiple clean kicks and punches to the head starting the third round. Stay tuned for future Bellator news and coverage. Please like, share, and subscribe!